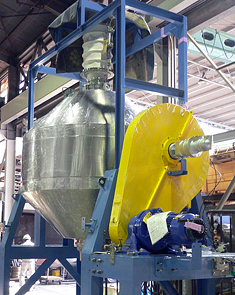 Double Cone Dryer | KATSURAGI INDUSTORY CO.,LTD.- Dryers,Drum Flakers,Concentrators,Crystllizers. 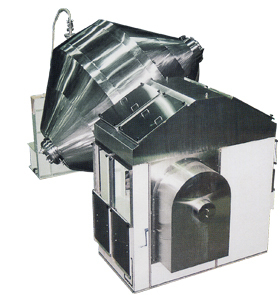 Double Cone Dryer, which is a conducted heat transferring rotary dryer of batch operation, mainly suited for vacuum drying of sludge form materials. The main body is a tumbler with a jacket mounted, in which raw material is fed to the extent of 30 - 50% of the total capacity, and agitated and dispersed repeatedly by rotation to dry. Materials are dried under the tumbled and agitated state, resulting in a high efficiency and allowing the materials to be dried up to a low-moisture state. Particle fractures of materials are few and mixed precision is relatively high, which makes it possible to obtain uniform dried products. Since the material directly contacts the heating surface, heat transfer is not disadvantageous under vacuum. Thus, the amount of heat loss is relatively small. Since it can be operated under high vacuum (low temperature) by selecting a shaft sealing type, it is suitable for drying materials which are subject to air oxidation or deterioration by high temperatures. Since the internal structure of the main body is simple, the inside can be cleaned easily. Thus, there is no concern about mixture even if different types of materials are treated. 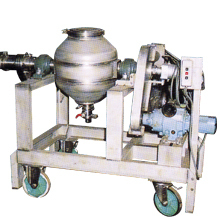 It is relatively easy to feed and discharge materials. It can be used for materials whose vapors have hazardous properties or solvents. Hot water, steam, and heat-transfer oil can be used as the heat source.